This tree is a remarkable piece of topiary in the form of a large bird. (Buddingh', F., 1997). 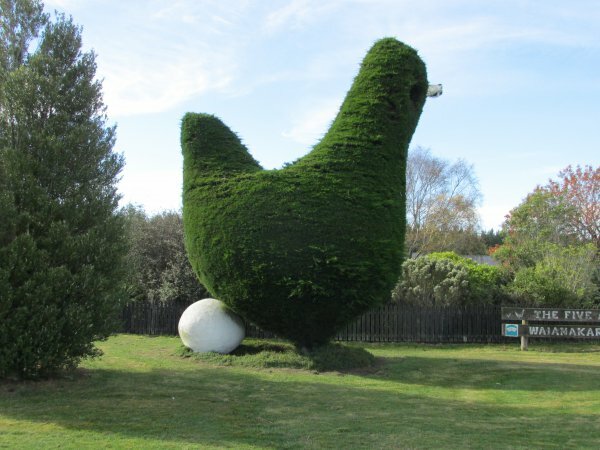 The sculptured hen was created in 1978 by poultry farmers Norman and Evelyn Clarke. The Macrocarpa tree was initially damaged in a storm with the remnants looking for all the world like a giant chicken. And so it was with a little more judicious pruning by the Clarkes for the tree to attain the shape it is today (Cadwallader 2013). 03 May 2015 Cadwallader, B.G.